This is a beautifully painted representational landscape by Amy Difley Brown (1896-1987). I never see her work around any more and this oil is pretty special. Looking at Mt. Moran from the curve on the road known as Oxbow Bend, one of my favorite places. This painting even looks better than the photograph. The tetons just ring like a bell when you put some light on them in the most luminous fashion. 16 x 20″. oil on board. Signed l/r and on stamp on verso Amy Difley Brown Santee, CA. p.o.r. Amy Catherine Griffiths Difley Brown O’Toole (1896-1987) was born in New York on July 9, 1896. By the early 1920’s Amy Griffiths had settled in San Diego, California. 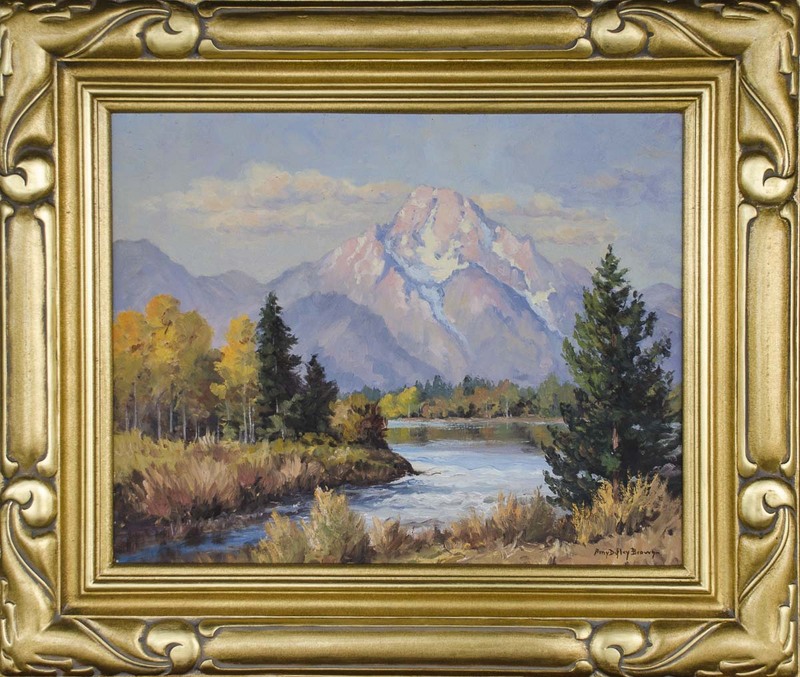 Early in her painting career she was known as Amy Difley Brown. Later in life she married R. L. O’Toole. She traveled the deserts and coastlines of Southern California on horseback, capturing plein air renditions of the California landscape and shorelines. Later in life she lived in the San Diego suburb of Spring Valley. She died in San Diego, California on December 15, 1987. Her works are in the collection of the Serra Museum in San Diego.